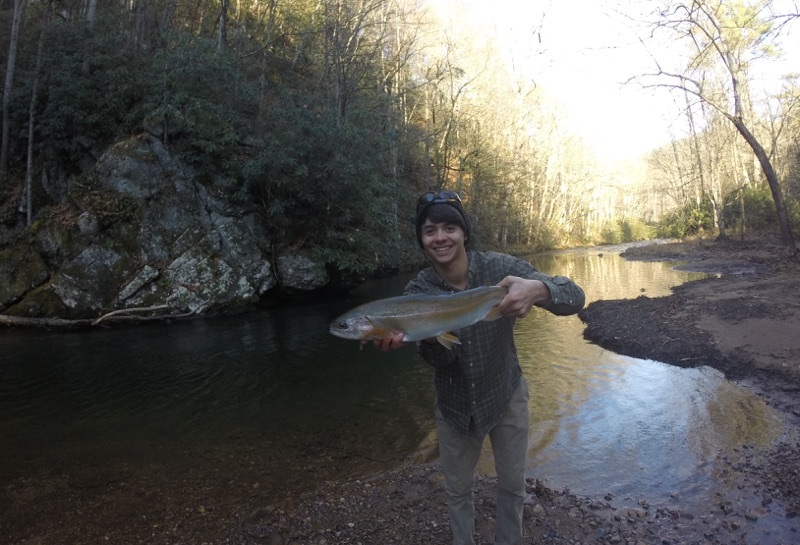 I was browsing on the internet one day, looking for a new trout stream to try, and stumbled across some reports on the tye river in nelson county. It sounded like a decent stream, and I love fishing new water, so I talked to my grandfather, and we headed to the tye one saturday afternoon. We got a little lost on the way there, and were on the river below the stocked section, so we decided to ask for directions. We saw another grandfather-grandson pair in a truck with "farm use" tags stopping to check their mail, and noticed there were two fishing poles poking out of the back of the truck, so my grandfather rolled down his window and asked the man how to get to the stocked tye river. The man said "We're headed up thar right now so y'all can just foller us". So we followed the truck to a bridge that crossed over the river, and they stopped and got their poles, so we pulled over and I grabbed my spinning rod with a trout magnet tied on, and walked down to the river. The tye had been stocked that week so I was expecting to see a big school of blue-green colored rainbows sitting wherever the water was slow and deep. To my suprise, I saw no trout, and didnt get a single strike when I cast my bait in every "trouty" looking spot in the hole. So we packed up and headed up the stream. We came to another bridge and parked, this time I was pleased to see a large school of trout holding just below one of the pilings, I cast my trout magnet above the school and immediately the trout were darting and rolling around the bait, but no hits, I cast again and caught a 10" rainbow, that I released, assuming there would be many more where that came from. Well as it turns out, they played the lockjaw game, agressively chasing but not biting, anyone who fishes trout magnets has experienced this. They did that for quite a while, and the rainbow was the only fish I caught untill a half an hour later when I dug up a worm and caught a 12" brown on it (which I kept). I dug some more worms and caught 2 more trout, both browns, a 9" and a 14" (kept them both). We got back in the car and drove to another bridge on road called battery hill, the water was too swift to fish under the bridge (athough I managed to catch an 11" brown to add to my creel) , but I saw the river bend further down stream, so I went to look for the hole below the river bend that almost always is present, no matter the stream. To my suprise, I stumbled upon a HUGE pool, at least 80 yards long, 25 yards wide, and 8 feet deep. The pool was teeming with 1-3 pound trout but they refused to take the trout magnet. I saw a big carp swim by but my heart skipped a beat when I took a closer look and realized it was a huge male brown. I took probably 15 casts at him and he didnt give the bait a single glance. And then I heard my grandfather yelling from upriver that we had to go, so I decided to take one last cast at the brown, and something just felt right about the cast, but again he didnt even glance at it. So I went home, but the memory of the fish really stuck in my mind, and I knew I would be returning to the tye for him.